Not long after we had opened all Es 11th birthday presents the skip lorry arrived to swap yet another skip. 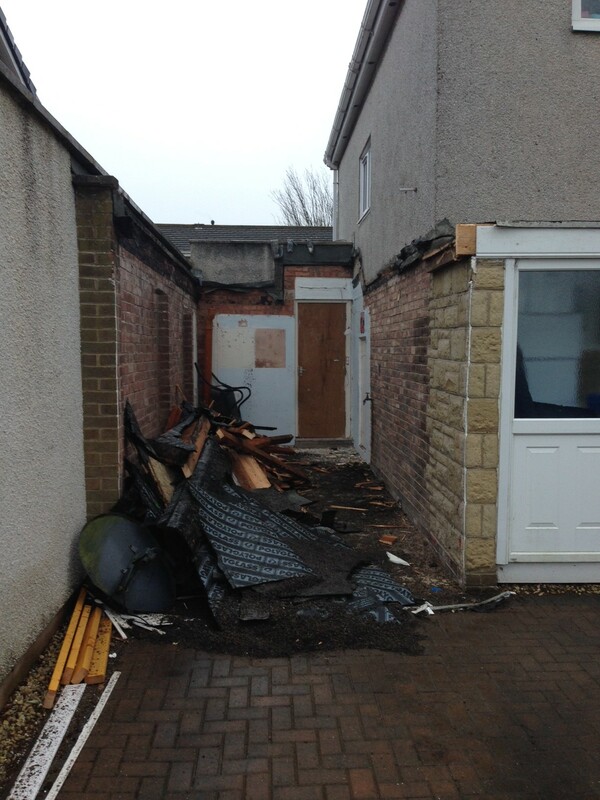 This morning was spent demolishing the back walls. All finished for the weekend. It has been exciting watch how much progress has been made in 7 days – what will next week bring? The digger arrived today to dig the foundations for the extension﻿. Mark was stuck in the house as every time he opened the door the digger was there. He did escape to the gyle only to come home to water gushing as the digger had hit the water mains. There is no photo as the builders were a bit stressed and mark thought not a good moment to ask😊. a real ‘walk the plank’ to get to the door. Grandad came to the door in the dark, think we maybe need a cone so everyone knows there is a hole. It was a cold start to Day 5 as the heating didn’t work last night. Everyone went to bed with extra blankets and bed socks and were cosy. It makes you realise how much you take the central heating for granted. There was still hot water last night so I was optimistic for a shower this morning but no such luck – so ended up having the quickest cold shower! The heating was fixed very quickly as the pilot light had gone out but as it is now outside we couldn’t have fixed that. 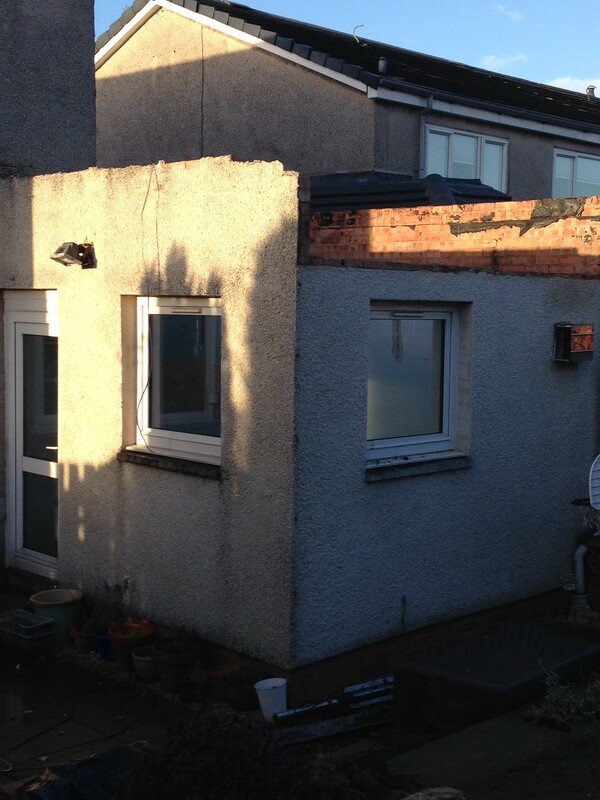 The boiler is on the left side of the picture below, the builders have protected it. The hot water took longer as there was an air lock but by 4.15 the plumbers fixed it and we are now warm again! 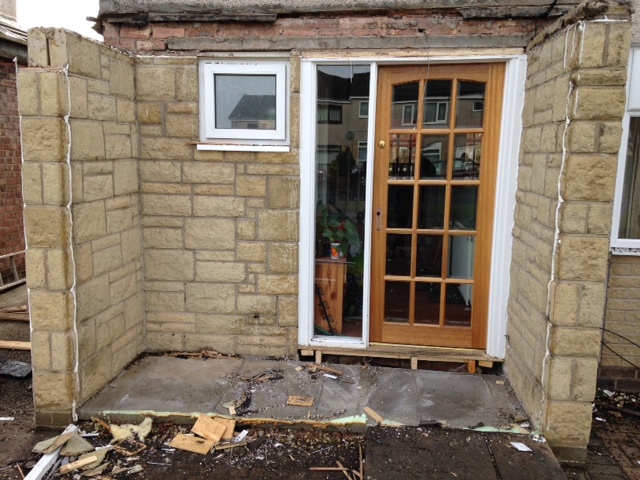 The windows and door have also gone from the back room. 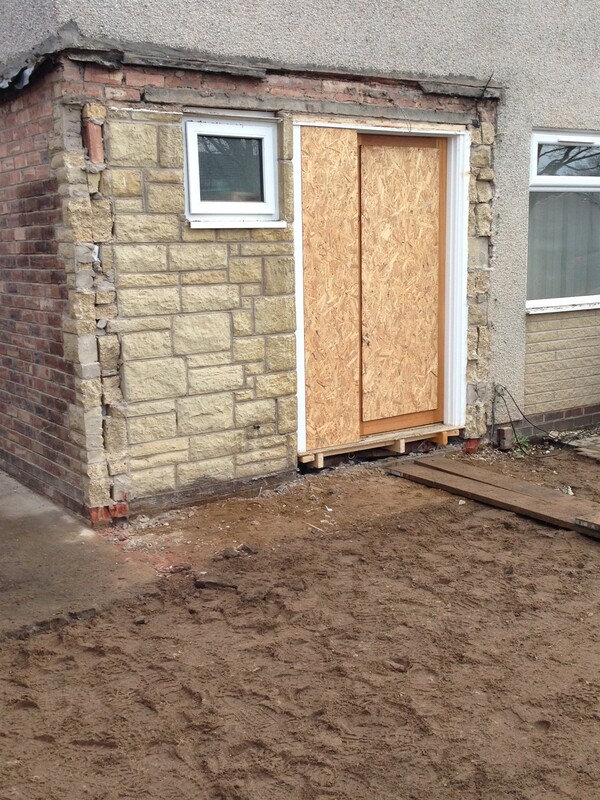 After the heating was fixed the porch came away, the internal door has now been boarded up and mortis lock fitted so we are secure. A bit draughty but our next door neighbours have given us their ikea snake draft excluder and hopefully Rosey has a pair of long curtains in the attic. B loved walking the plank to get to the front door. Mark had a selection of football posters in the garage and the builders have kept his FC Bayern one as a momento! 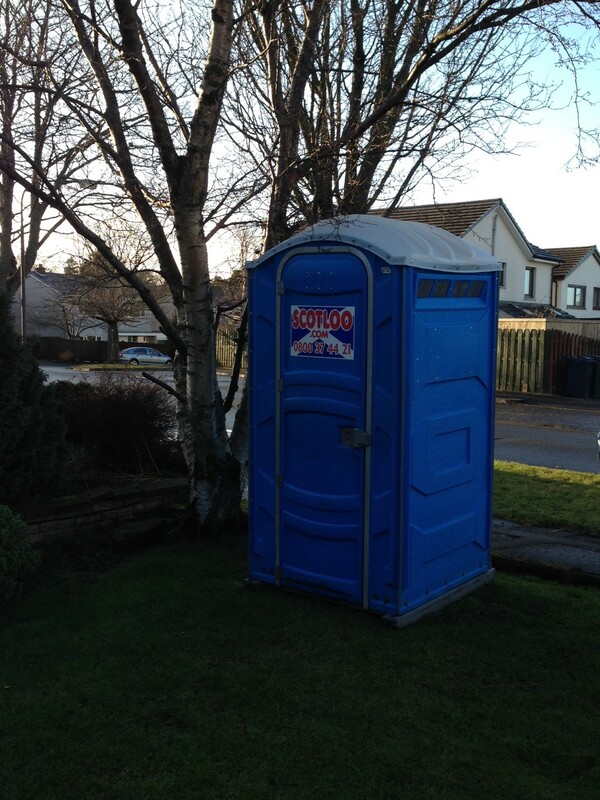 The porta loo arrived today which will stop kids climbing on the tree! 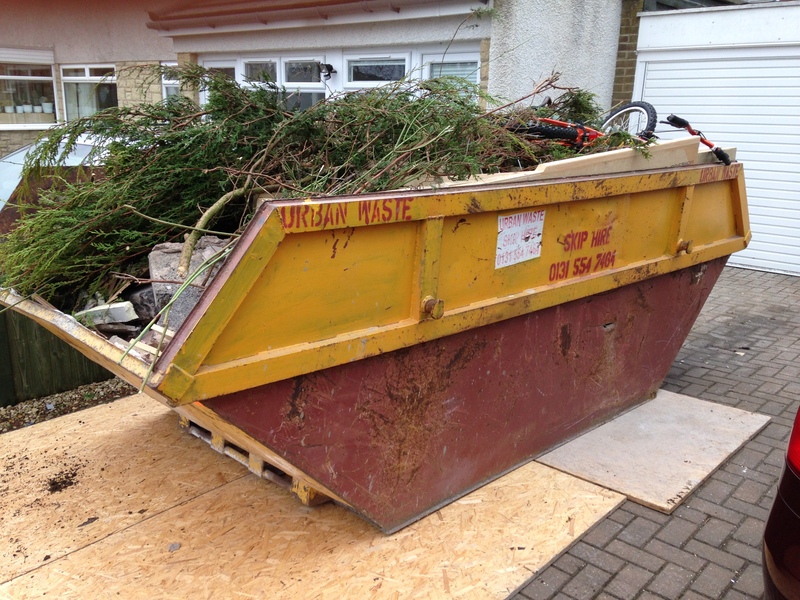 The skip has come back and is now full for the second time today! The entire roof has now come off, a pipe was burst when taking the radiator out of the back room, luckily the plumber was free and came out so when I came back from work there was hot water and heating. 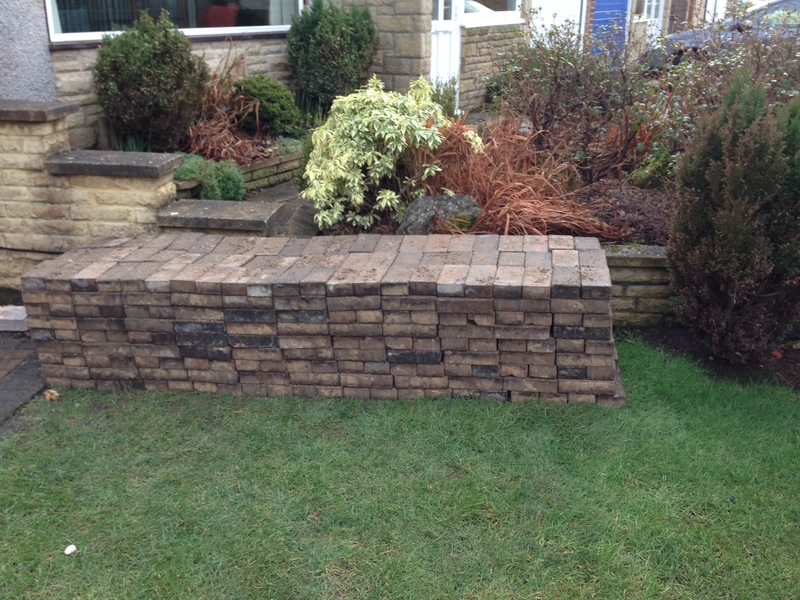 Mark has finished clearing the porch ready for it to come down tomorrow. It is a shame we kept so much in it as it feels huge now it is empty. E’s bike is out of the hut ready for her bikeablity training at school tomorrow. Mark was up early this morning to move the last few kitchen cupboards to our friend Amanda’s Garage (thanks Amanda) Hopefully we can use them in the utility room. The builders arrived soon after the electricity had to be turned off a few times stopping TV viewing this morning. 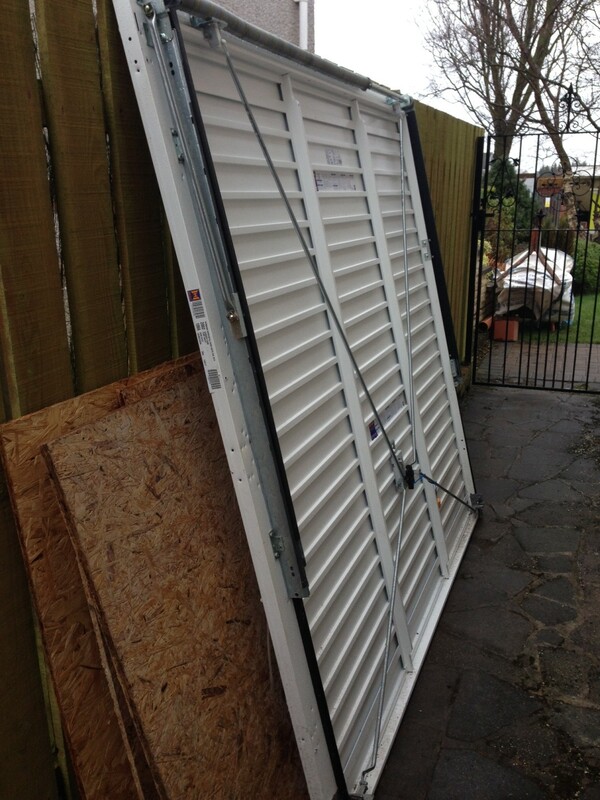 They then set to work removing the garage door, It is being stored at the side of our house as our friends may be able to use it to replace their broken garage door. 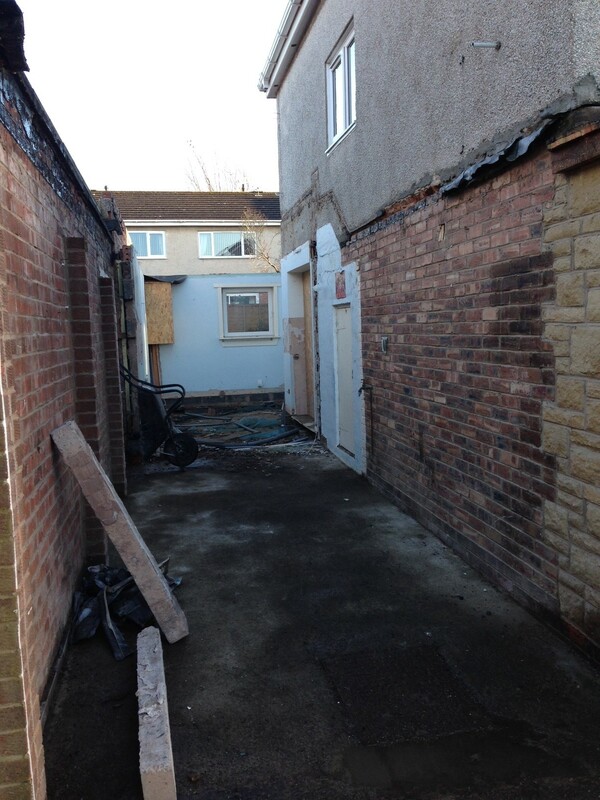 The floor and roof of garage have now been removed. 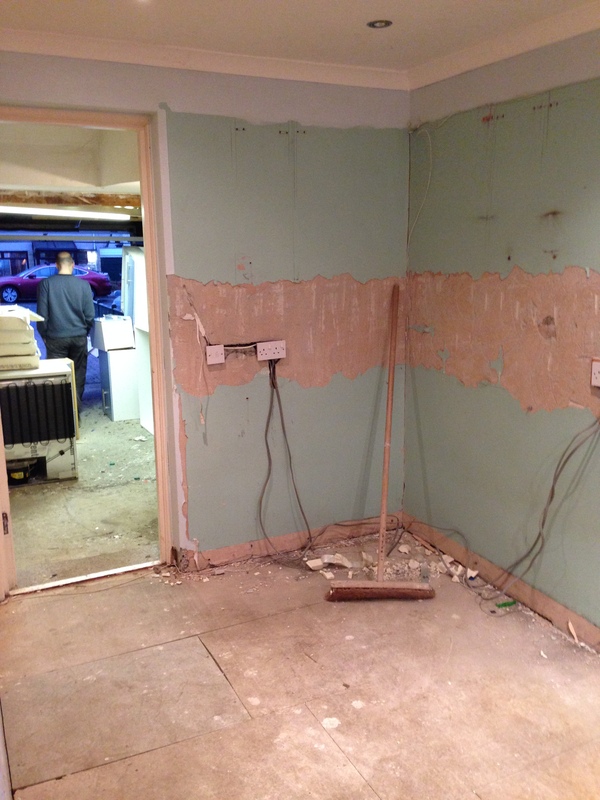 While the builders have been away we have been continuing to de clutter and are almost there. Our next mission is to empty the porch as that is coming down later this week! 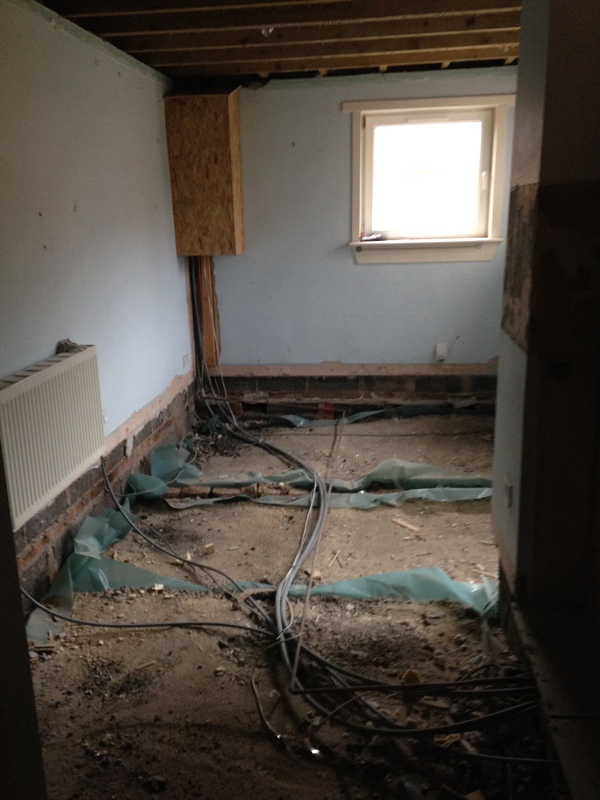 The back room floor and ceiling was stripped out today. A skip arrived and is already full. Burglar alarm has been adapted so we can still use it. 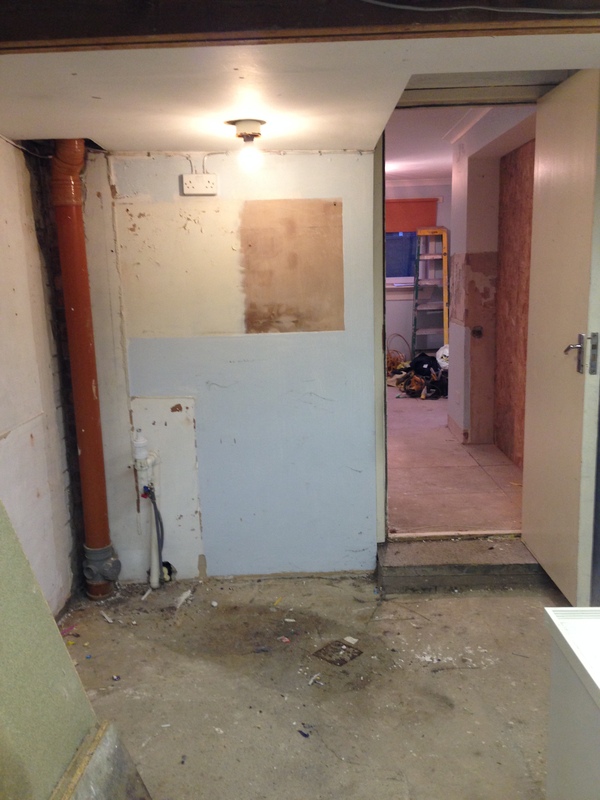 Builders have now gone back to their current job that they had nothing to do and will return in a week and a half. That gives us time to sort the rest of the house and de clutter some more. 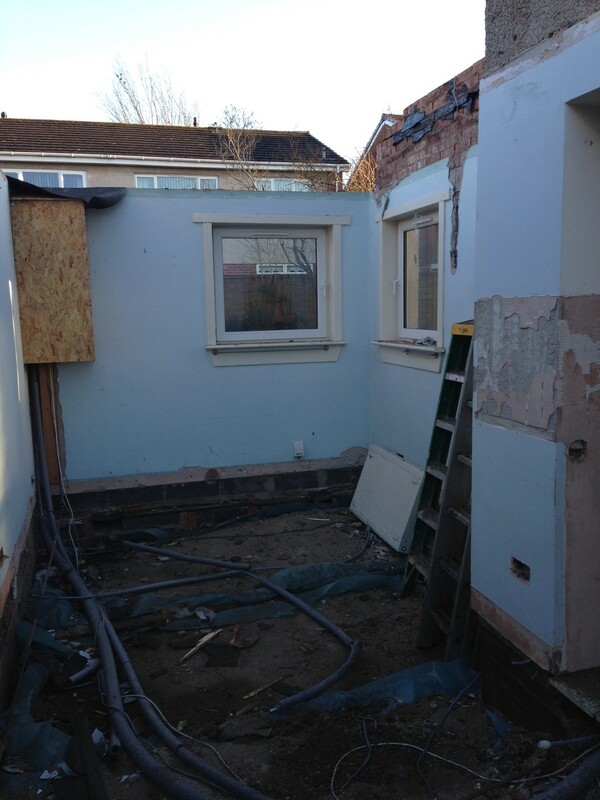 The builders arrived at 8.30 and they didn’t hang about stripping out the garage, utility and back room and built the wall to allow us to live in the house while the work goes on. 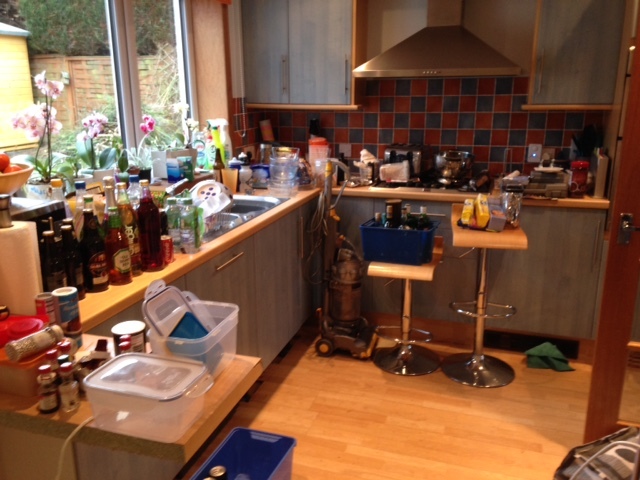 There was a mad dash to empty the last of the cupboards, no work surface space left. The dishwasher has been taken out of our kitchen and the washing machine plumbed in its space which means we don’t have to take our washing anywhere, yet! 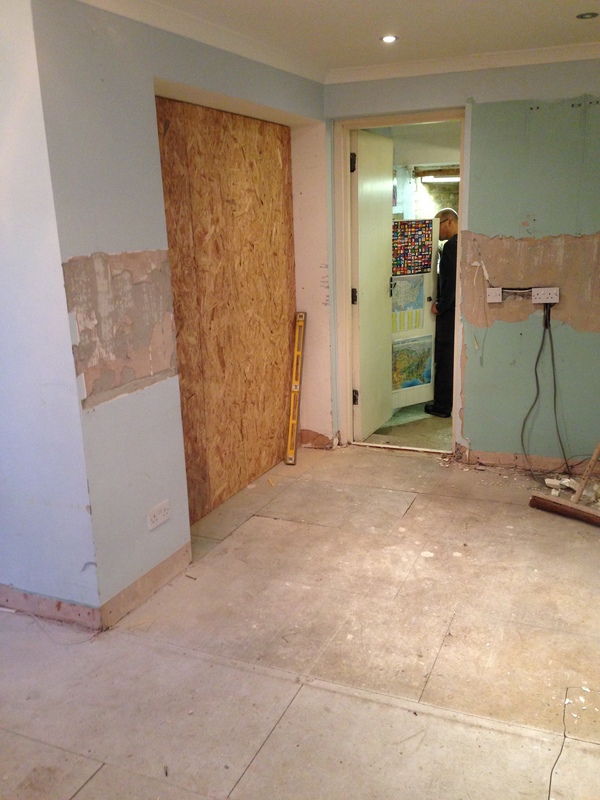 The kitchen cupboards, tiles and flooring have gone from the back room. 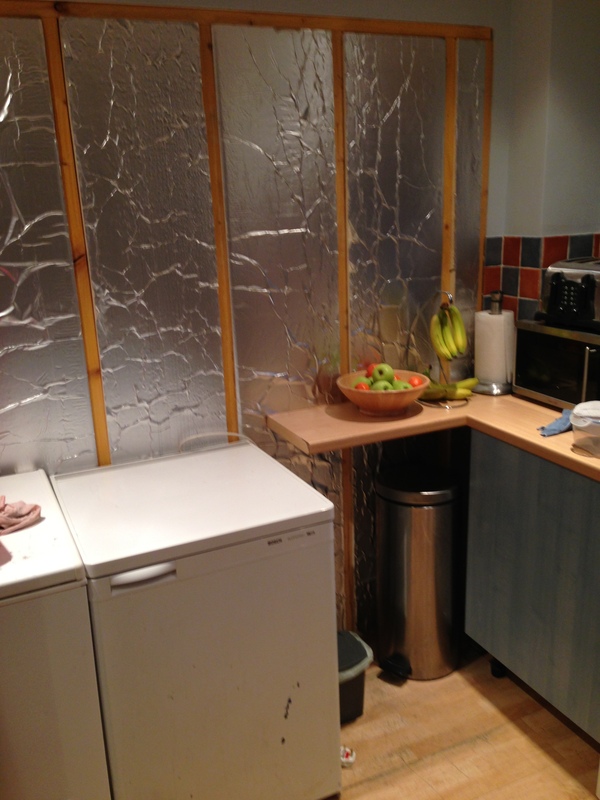 Just need to find somewhere to store the kitchen cupboards until we decide which ones we can use in the utility room.